← Why are Areas Used by Protected Species at Craighouse having Nature Designation Removed? 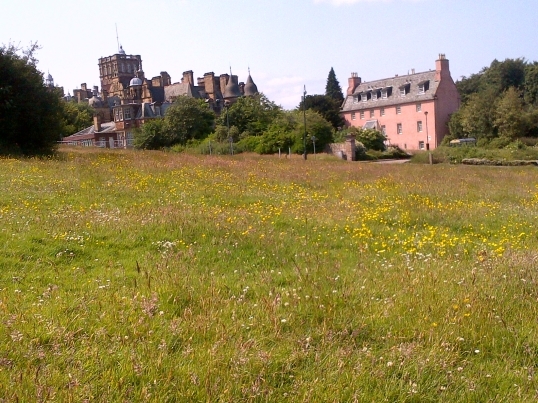 Craighouse is looking beautiful in the sun and there were lots of children out enjoying the site yesterday – racing through the grass. One family stopped to tell me how much they are loving “the meadow” – how fun it is to play in and how beautiful with all the flowers. Another resident told me they saw a sparrowhawk on the meadow. 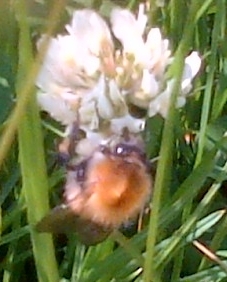 I spent a stupid amount of time taking out-of-focus pictures of all the bees enjoying the flowers that have sprung up everywhere you look over the meadow. The carpark – surely one of the prettiest carparks in Edinburgh right now – is full of dog roses and other flowers and the meadow and carpark are covered in bees and other insects collecting pollen. Bees are the subject of much debate in the newspapers as populations plummet and organisations and governments debate the reasons and how to save them. The “meadow” is covered in buttercups, clover, and blue flowers that I hope someone will be able to name for me. Lots of varieties of grasses – the purple grass and yellow buttercups grow at different points on the rig n furrow therefore highlighting this interesting feature as never before. dogrose hedges providing a bee heaven in the carpark (click to view fullsize). 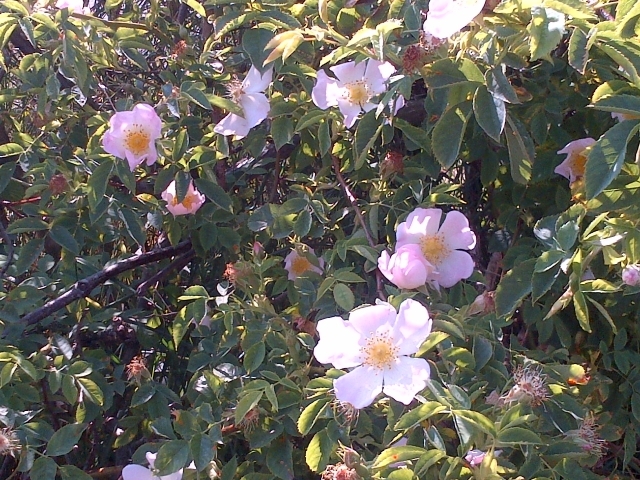 The carpark is full of flowering roses – dog roses, and other varieties. The carpark was apparently designed to be planted in a way as to not ruin views and vistas. It forms part of the setting of Old Craig – the oldest building on the site. In notes of meetings with Historic Scotland and the Council we have obtained through Freedom of Information, all the bidders were told they could NOT build on the carpark or in the setting of Old Craig before they even bid for the site. They were told this in meeting with the Council and Historic Scotland. So why are the Craighouse Partnership now thinking they can get away with the carpark not just being built on but just one part of a large housing estate taking out green space and woodland and ruining the views and setting of Old Craig, the entrance to the site and making a large area of this natural site urban? It is interesting to note that the meeting notes for the other bidders have been made available – but the meeting notes from the meeting with Mountgrange (separate from all the others) are declared to be lost. For commercial fairness, all the bidders should have been told the same thing. If Mountgrange are let get away with this, it is unfair on all the other bidders who bid for the site and drew up plans based on what they were told at these meetings. The Craighouse Partnership are now boarding up the buildings and the entrance will be blocked with the only pedestrian access through the lodge entrance and up through Craiglea Place. We continue to urge people to use the site. Use it, access it, love it. We mustn’t allow ourselves to be put off by obvious attempts to impede open and free pedestrian access. Access on the site is historic and long-established with full and free public access for many decades. Apart from anything, if the Craighouse Partnership cared at all about the site, they would encourage the public to use it and access it and make the entrances to the site welcoming. As it is – the napier signage has been removed but not the messy metal holders – why? And the main entrance is to be blocked to pedestrians as well as vehicles. Why? We must not allow the site to be held to ransom for a development which would ruin what is so special about this place and undermine protections for other important and green spaces across the city. The hearing – which was originally for March – was moved to June and then to August. The Craighouse Partnership failed to meet all the deadlines and this time a new processing agreement has not been signed so we have no new hearing date yet to inform you of. All we can say is that they have missed their deadline for there to be a hearing on the 14th August so this date – again – has been cancelled. Craighouse remains a haven. All of you amateur (or prof) photographers out there – if you have pics of the wildlife or flowers – even small things like insects do feel free to post them on our Facebook page, or send them into friendsofcraighouse@yahoo.com – it’s very useful for us to have. Have you organised a Bioblits of the area at all? or worked with The Wildlife Information Centre to collate information on all the wildlife in the area?